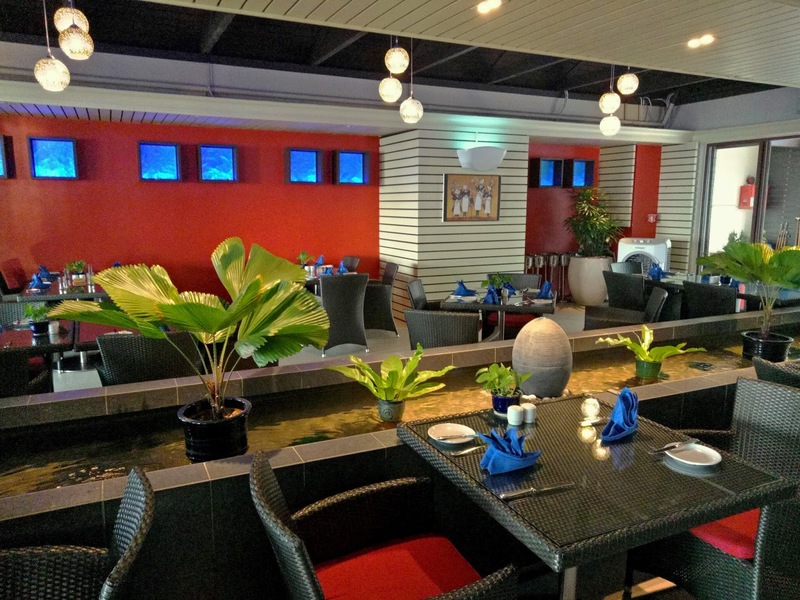 Sigi's Bar & Grill is one of the two main restaurants in Golden Sands Resort; the other is Garden Cafe. 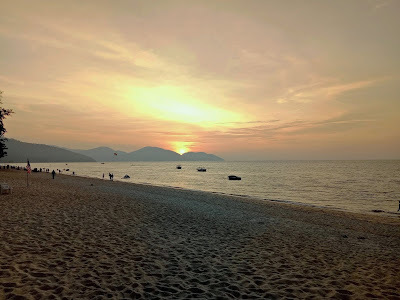 This wooden building was formerly a private holiday retreat owned by the late Sultan of Perak, Sultan Azlan Shah. In the indoor dining area, a small pond separates the hall into halves. As a beachside restaurant, Sigi's also offers al fresco dining under the shade of coconut palm trees. With lovely views of the sea and golden sunset over the horizon, the place presents a relaxing setting for holidaymakers. 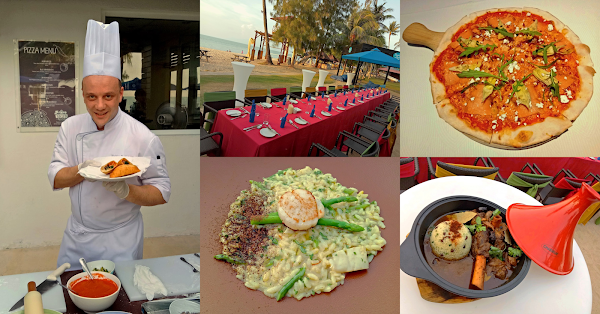 As part of Shangri-La's guest chef program, Golden Sands Resort is having Chef Fabio Polidori this week. Chef Fabio currently serves as the Executive Chef of Shangri-La Hotel Qingdao. Hailing from the small town of Fossombrone in central Italy, Chef Fabio grew up in a family which revolves around home-cooked Italian food. 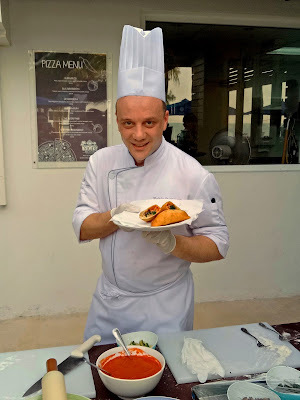 Chef Fabio has 2 decades of culinary experience, having worked in many restaurants around the world including in Australia, Greece, United Arab Emirates, China, Thailand and Malaysia. Passionate about experimenting with food, Chef Fabio's forte is Mediterranean cuisines. His signature dishes cover Italian, Greek, French, Spanish and Moroccan recipes. This evening, Chef Fabio is giving a live cooking demonstration at Sigi's. 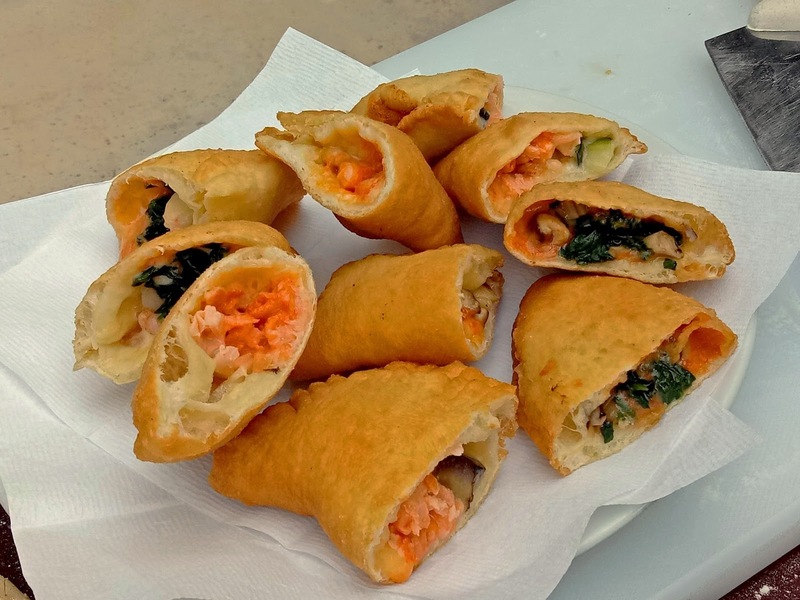 Today's subject is folded pizzas called panzerotti, a popular street food in southern Italy. Panzerotto means "little belly" in Italian because the pastry resembles a bloated belly when it is cooked. Panzerotto is similar to calzone but the former is deep-fried instead of being oven-baked. Panzerotto is made from the same flour dough as pizzas. After flattening and shaping using a rolling pin, the dough is topped with mozzarella cheese and tomato sauce. 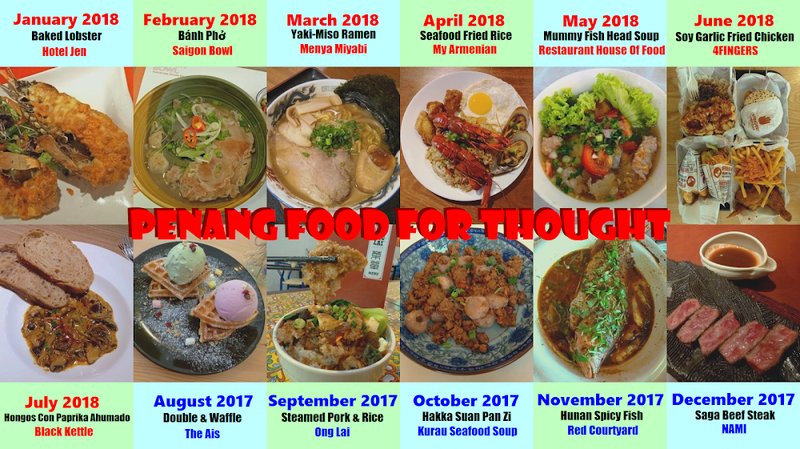 Other toppings include seafood like tuna, salmon, white snapper, shrimp and squid. Vegetable choices are spinach, zucchini, bell peppers, eggplant, black olives and mushrooms. The dough is folded and sealed, and then deep-fried so that it becomes crispy. Panzerotti are similar in appearance to local curry puffs. Chef Fabio is also showcasing many of his signature dishes this evening. For instance, Gambas Bravas (RM40.00) is a Spanish appetizer based on shrimps ("gambas" means "shrimps" in Spanish). 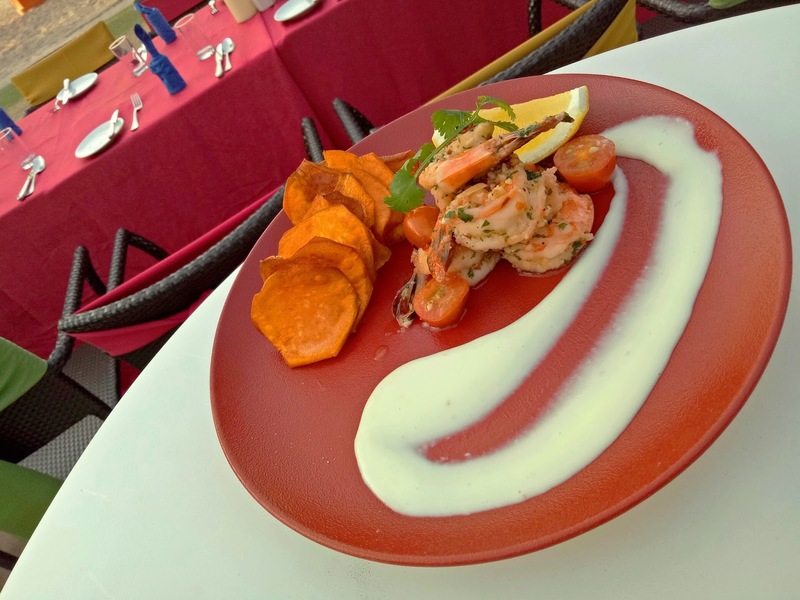 Sautéed with garlic and herbs, the prawns are served with cherry tomatoes, lemon and aioli. Meanwhile, sweet potato chips on the side are Chef Fabio's interpretation of patatas bravas, although the traditional recipe uses white potatoes instead. 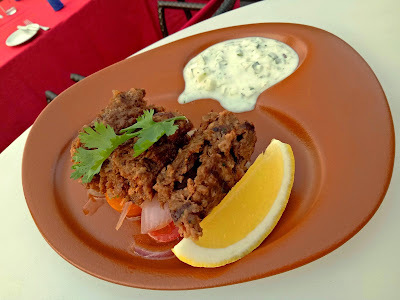 The second appetizer, Beef Keftedes (RM27.00), is Greek in origin. "Keftedes" is the Anglicized spelling for the Greek word, κεφτές. The beef meatballs are served with tzatziki (τζατζίκι) sauce, a traditional Greek sauce made of yogurt. Meanwhile, cherry tomatoes and lemon juice serve to provide citrus tanginess. Overall, this dish is exquisite indeed. 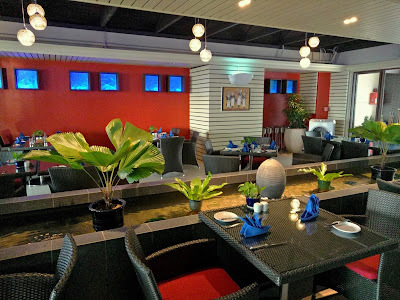 Pondicherry Soup (RM32.00) is named after the city of Pondicherry, a former French colony in India. 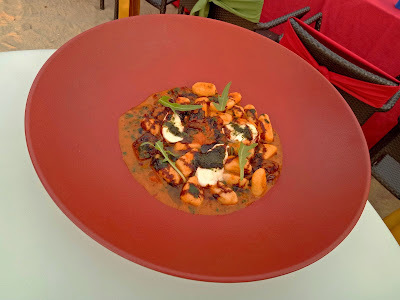 Created by a Michelin 2-star chef whom Chef Fabio has worked with before, the soup is formulated from a special blend of 12 spices. 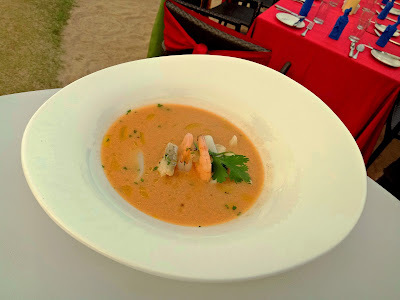 The Pondicherry Soup is also loaded with seafood like shrimps, squid and fish. Chef Fabio took some creative license by replacing coconut milk with fresh milk, and by removing the curry flavor that is typical in Indian stews. 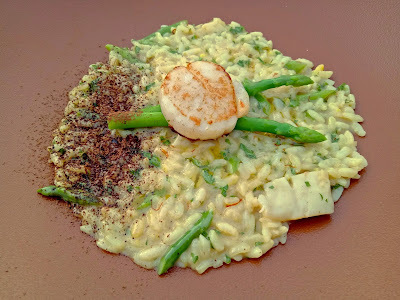 Scallop Risotto (RM43.00) is one of my favorite dishes this evening. This traditional rice dish is particularly popular in northern Italy. The risotto is cooked in flavorful broth to a creamy consistency. 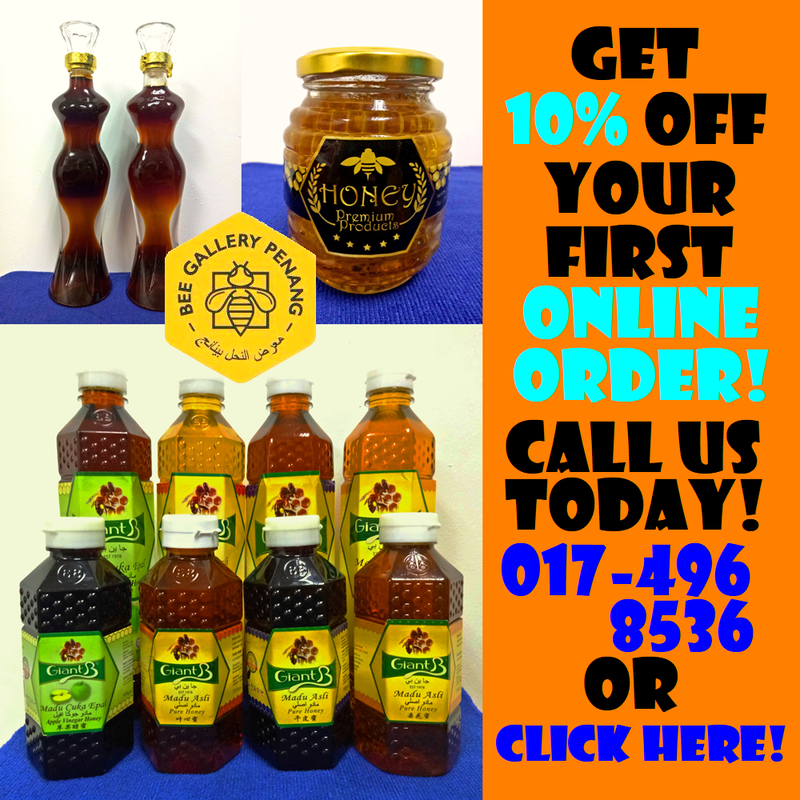 Saffron lends its lovely flavor as well as the distinctive yellow color. At the top is a succulent piece of grilled Hokkaido scallop. Also included are crunchy asparagus and a light shower of cocoa powder. Potato Gnocchi (RM39.00) are another traditional Italian dish. The soft dumplings are made from semolina and potatoes. Although ready-made gnocchi are commonplace nowadays, Chef Fabio prefers to make them the old-fashioned way, i.e. by hand. The gnocchi are served with sun-dried tomatoes, buffalo mozzarella (mozzarella di bufala), pesto sauce and arugula (garden rocket). Chef Fabio picked up the recipe for Moroccan Lamb Tagine (RM110.00) while working with a Moroccan chef in Dubai. 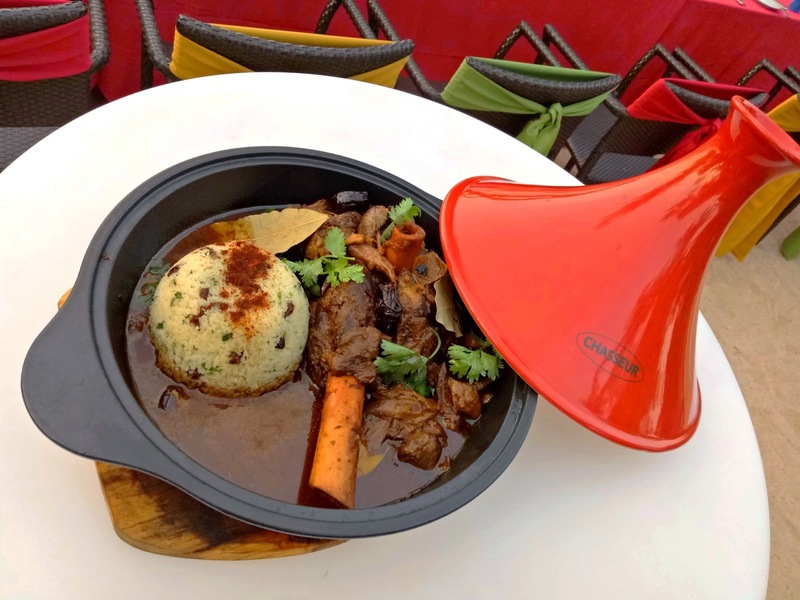 Tagine (الطاجين) also refers to the earthenware pot in which meat is traditionally stewed. The cone-shaped lid helps to retain moisture - essential considering the scarcity of water in North Africa. Tagine is customarily cooked over hot charcoal, but this is obviously not practical in Sigi's. Served in savory gravy rich in spices, the lamb shank is cooked to perfect tenderness. At the side is a large serving of couscous (كُسْكُس‎). Made from semolina, couscous has a light and fluffy texture. The serving size of Moroccan Lamb Tagine is huge because it is meant for 2 persons. Harissa (هريسة‎) is a North African blend of spices including red chili peppers. This condiment is used in the Harissa Salmon Steak (RM73.00). 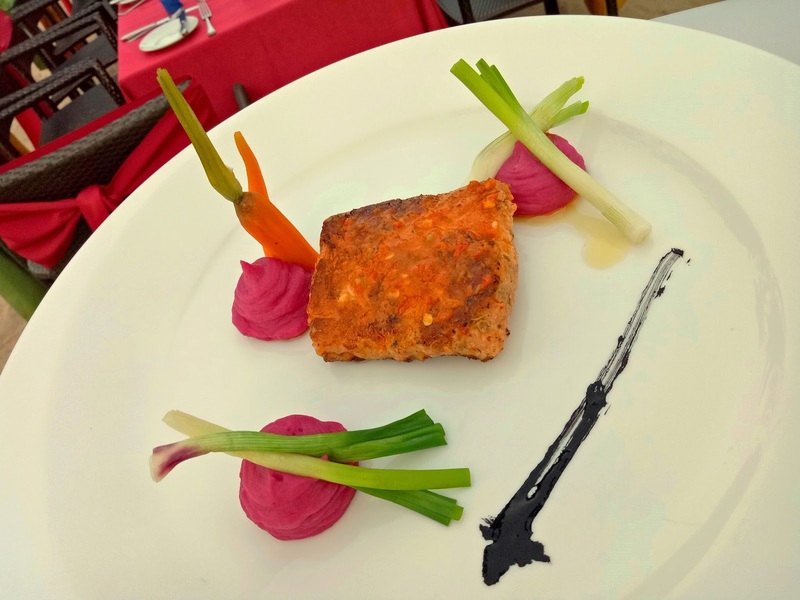 Grilled to perfection, the salmon fillet remains fairly juicy even when the skin has become crispy. As for presentation, the plating involves mashed beetroot, charred scallions and squid ink. 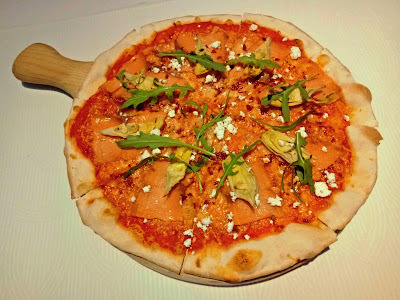 The Affumicato Pizza (RM42.00) has delectable toppings like smoked salmon (salmone affumicato), ricotta cheese, artichokes, arugula and chili flakes. I love the crispy texture of the thin crust. 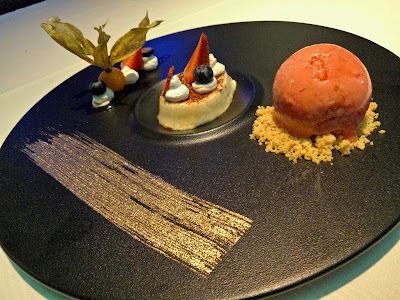 This evening's desserts reflect the experiences that Chef Fabio has picked up around the world. One of them is Panna Cotta Mont Blanc (RM24.00). The panna cotta presents gentle sweetness on the tongue without overpowering the taste buds. Also included is a scoop of raspberry sorbet as well as a brush of gold paint. Most of Chef Fabio's signature dishes go well with wines. 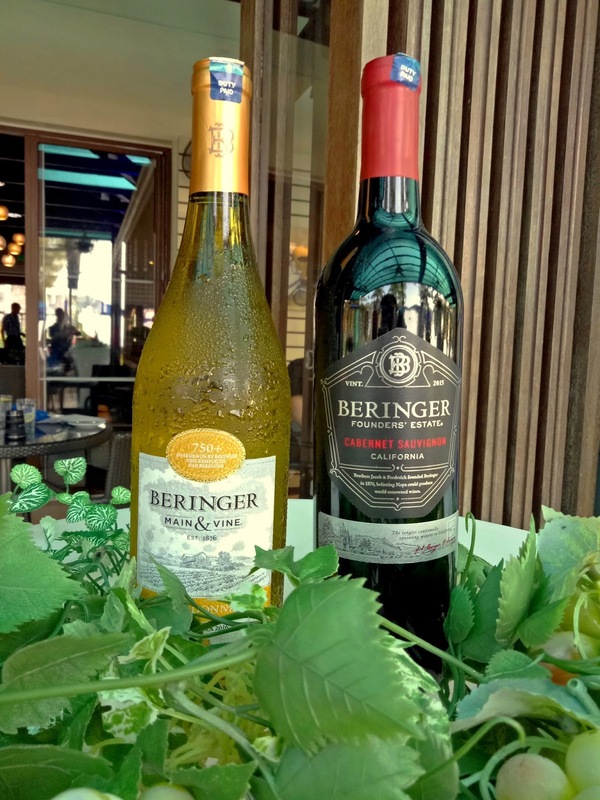 For white wine, Beringer Main & Vine Chardonnay (RM135.00) is the recommended choice. As for red wine, diners may enjoy a bottle of Beringer Founders' Estate Cabernet Sauvignon (RM160.00). Sigi's menu also covers a wide variety of cocktails. For instance, the Tiki-style Mai Tai (RM32.00) contains a mixture of rum, orange Curaçao liqueur, orgeat syrup and lime juice. 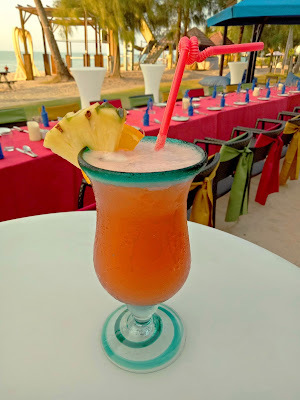 The cocktail's exotic tropical taste makes it an excellent thirst quencher. Other recommended cocktails include Golden Sands and Sands Cooler. Chef Fabio's signature dishes are included on Sigi's à la carte menu throughout the month of March 2018. 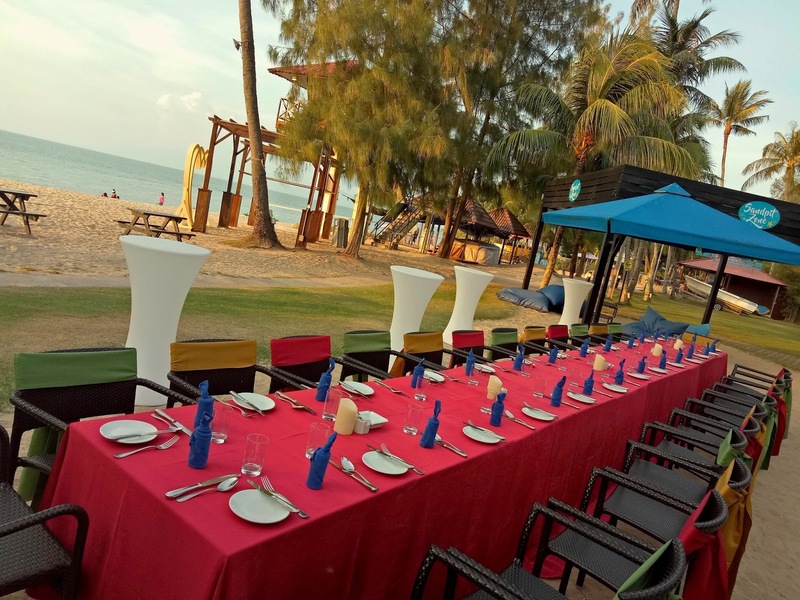 The dishes are served during dinner only, and are not available on Fridays and Sundays because buffet is served on these days. It is always a great pleasure to meet chefs from around the world. 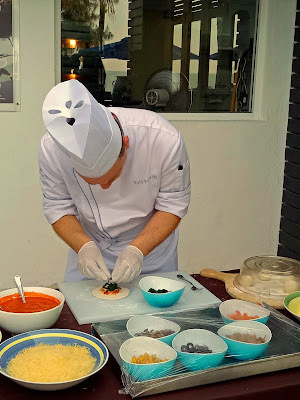 Therefore, I am glad that Shangri-La has an active guest chef initiative.